(...) this singular pianist's actual musical accomplishments (...), as this new release of Haydn sonatas amply demonstrates, are of compelling interest. (...) Barto focuses on the fullest exploitation of the modern concert grand's resources to create richly imaginative Haydn interpretations of great integrity, warmth, and originality. Recommended. Surface glitter is eschewed. (...) No 60, written for piano, where depth of feeling takes in the full dramatic force of the work. 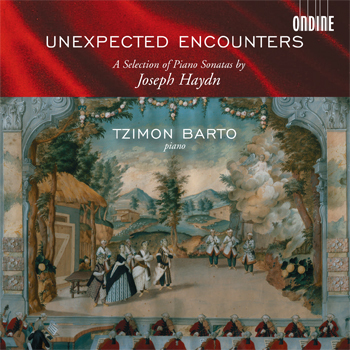 Tzimon Barto's playing of the present four Haydn Piano Sonatas reveals his understanding of Haydn's complex, profuse and multifarious musical nature. Barto has the requisite clarity and precision for Haydn's piano writing. Levy kannattaa ehdottomasti hankkia jo pelkkien adagiojen perusteella; niissä Barto lukeutuu pianistien ehdottomaan elittiin. Barto artikuloi kellontarkasti jokaisen nyanssin, kosketuksen ja taitteen. Soitosta tulee mieleen toinen kuuluisa perfektionisti, niukka esteetikko Glenn Gould. (...) Hänen tarkkaan harkittu ja hiottu soitto avaan Haydnin sonaateista sellaisia sfäärejä, vivahteita ja tasoja, mitä kuulee harvoin. Die CD gehört zum Besten des Haydn-Jubiläumsjahres. (...) Schillernd-tragisch und unergründlich, erweist sich Barto (...) als einer der vielschichtigsten, feingeistigsten und besten Pianisten der Gegenwart. (Man) spürt einen Haydn-Ernst, wie man ihn noch nie hörte. Für Barto, in dessen Haydn-Spiel buchstäblich jeder Ton zählt, besitzt selbst das Einfachste noch unergründliche Tiefe, weshalb er (...) einen komplett enthistorisierten Blick in die Gefühls- und Gedankenwelt dieser Musik riskiert. Auf seiner neuen Haydn-CD (...) lässt Barto so viel bitter erworbene Lebensintensität, so viel tänzerischen Trotz und Trauer hören, wie das seit Jahren niemand wagte. Barto gibt den Noten Raum, begreift sie nie als bloße Fingerübung. Vielmehr sucht er in diesen Sonaten nach dem Funkeln im Inneren und wird auf köstliche Weise fündig. Selbst in den einfachsten Passagen. Tzimon Barto (...) überrascht immer wieder mit seinen Aufnahmen. (Er) verleiht den Sonaten Nachdenklichkeit und Tiefe, (...) spannt einen großen Bogen über jeden Satz, und lässt die von ihm artikulatorisch strikt durchgeplanten Sonaten erstaunlich spontan, leicht und luftig erklingen. This recording features pianist Tzimon Barto with a selection of piano sonatas by Joseph Haydn - a tribute to the 200th anniversary in 2009 of the great Viennese composer's death. The CD release contains the sonatas Hob. XVI: 1; 23; 27; and 50. The digital release (download and streaming) also includes the Sonata No. 53 in E minor, Hob.XVI: 34, as an additional bonus. Tzimon Barto is celebrated for his "refreshing" approach (American Record Guide) to known repertoire. His highly personal approach to these works - which he has devoted himself to for much of his career - enables the listeners to make their own "unexpected encounters" with these works. Making no attempt to be "historically correct," Barto focuses instead on his discovery of impressionistic elements, as well as inspiration drawn from theater and painting of the period. Tzimon Barto is recognised as one of the most radiant and unique personalities in the music world. Critics have hailed his musical maturity, superb technique, and endless color palette. Barto's two previous recordings for Ondine - keyboard pieces by Rameau (ODE 1067-2) and piano works by Ravel (ODE 1095-2) - have reached extraordinary success, if not "cult" status.